An exceptional place for people who appreciate relaxation and harmony at the same time as physical activity. Located in the fitness amd wellness club Holmes Place Premium, Spa For You complements the holistic philosophy of Holmes Place inspire people to live well. We are a haven in the center of busy Warsaw that allows you to unwind and relax. Spa For You offers a wide choice of professional treatments, guarantee of satisfaction, bilingual staff, convenient location and comfortable opening hours. 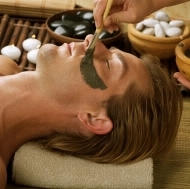 - Individual selected treatments for face and body will bring out the natural beauty. - Relaxing massages assure harmony and recovery of your energy. Our treatments are given with Thalgo cosmetics that contain algae and minerals from the sea, the American brand Dermalogica and the new French brand Purles. We also work with the highest quality waxes by Lycon and nail polish by OPI. Welcome! Book your treatment today.